Penticton is surrounded by two freshwater lakes, Okanagan Lake to the north and Skaha Lake to the south, with rolling hillsides comprised of large clay banks and dramatic rock outcroppings on the east and west plateaus. Okanagan River connects the two lakes, constrained by a man-made channel that is a tourist hotspot in the summer as vacationers “float the channel” in tubes and blow-up mattresses. With a population of approximately 33,000, Environment Canada says the City of Penticton has the most attractive climate of all Canadian cities, receiving an annual average of 2100 hours of sunshine and only 15 inches of rain! The area experiences four distinct seasons: long, hot summers with low humidity, and short, mild winters with minimal snow. Penticton is a tourist mecca in the summer, largely due to the attractive climate and numerous recreational opportunities the area offers. Penticton’s climate is well suited for agriculture and the area has always been known as a large producer and exporter of non-citrus tree fruits, such as apples, pears, peaches and cherries. In recent years, many of the orchards have been converted to grape vines and previously barren benchlands have been transformed into vineyards. Numerous boutique wineries have emerged and the wine industry continues to grow and attract tourists to the area. Thomas Ellis, a young Irishman, was the first European to settle here in 1865. The community began to grow as cattle ranches were established and fruit trees were planted. Ellis later became known as one of the most successful cattle ranchers in the province. In 1892 he opened the Penticton Hotel situated on Penticton’s first road – Front Street. This is still an influential area of Penticton’s downtown, known as “Colourful Front Street” located just off Main Street and only a block away from Okanagan Lake. Filled with unique shops, restaurants and boutiques, Front Street has remained a prominent location as the City expanded around it. Later in 1892 Ellis and his relatives retired and sold large parcels of land to developers. Over the next years the community grew at a slow pace, but stern wheelers arrived on the lakes allowing access for more goods and services. In 1908 Penticton was incorporated as a district municipality. The fruit trees that were started by Thomas Ellis began to produce and the fruit was packed and shipped internationally. Two years later in 1910, the Canadian Pacific Railway announced that Penticton would be the headquarters for the new Kettle Valley Railway (KVR). This line would connect the coast to the wealth of the Kootenays. This secured Penticton’s economic future. The population quickly grew, as people moved to Penticton for work on the railway. The Canadian Pacific Railway built the Incola Hotel in 1912 across the street from Okanagan Lake. The hotel operated for nearly 70 years before being demolished in May 1980. Today, the Incola site is home to the Lakeshore Towers, a residential complex that consists of three towers, with a total of 225 condo units, an outdoor pool, fitness centers and landscaped grounds. The Lakeshore condominiums continue to be some of the most sought-after executive-style condos Penticton has to offer. The KVR not only brought newcomers to the area, it also increased the speed and ease of transportation for the soft-fruit industry. In addition, the railway brought tourists to Penticton and put it on the map as a vacation destination - a destination that exists to this day. At the end of World War II, veterans returned to Penticton and the population and growth continued at a rapid pace. 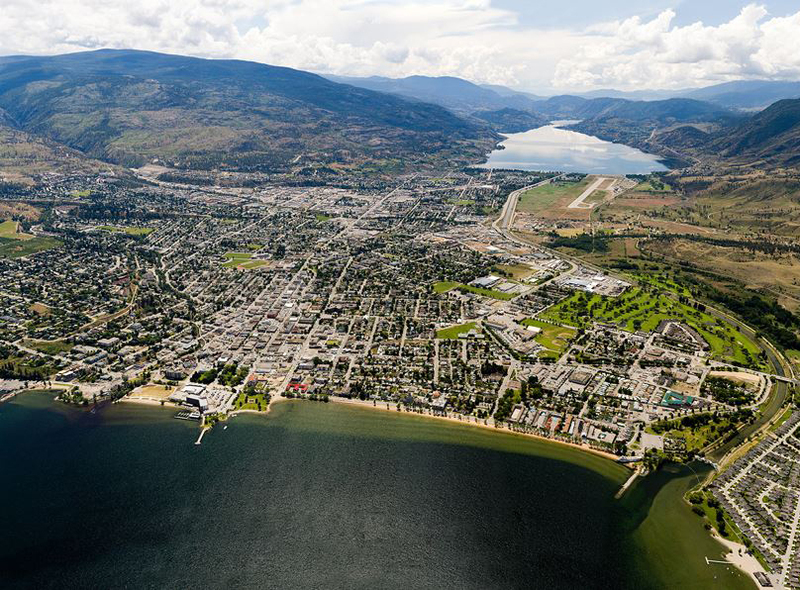 In 1948, Penticton was incorporated as a city – over the 50s and 60s Penticton saw major advances in large infrastructure projects, like the channelization of Okanagan River, a new city hall, and the first major shopping center. Penticton is part of School District #67 (Okanagan Skaha) and home to seven elementary schools (kindergarten to grade 5), three middle schools (grade 6 to 8) and two secondary schools (grade 9 to 12). In September of 2008, the state-of-the-art South Okanagan Events Center (SOEC) opened its doors. This multi-purpose sports and entertainment venue seats up to 5000 people, offering a wide array of sporting events from watching the local hockey team - the Penticton Vees - to professional bull-riding and Areanacross! The venue has also drawn large crowds by hosting big name musical acts such as Carrie Underwood, Heart, Rhianna and ZZ Top to name a few! Located right next door is the newly renovated Penticton Community Center. Home to two indoor pools, four sheets of ice, curling rink and tennis court - it is the place to be for swimming, fitness and programs for families and people of all ages. The Penticton Trade and Convention Centre is located beside the community center – providing an ideal space for trade shows, conventions, weddings and special events. Penticton Regional Hospital offers a full spectrum of medical services. This 129-bed acute care hospital will be seeing a major change commencing in 2016. A $325 million dollar expansion will bring a seven-storey tower with walk-in clinic, surgical services and space for a medical school. The existing hospital will also be upgraded and renovated, with completion slated for 2020. The Penticton Library and Museum are located at the Penticton Community Art Complex in the downtown core at 785 Main Street, offering a variety of ever-changing exhibits and free access to a wealth of knowledge. The Penticton Visitor Centre is a great source of information and can provide details on what's happening in and around the city. Penticton is home to a variety of churches and places of worship. A comprehensive list can be found here. Whether you’re looking for a quaint B&B or a large resort, Penticton has a wide variety of accommodations to meet your needs. - Pump up your air mattresses and tubes to float the channel! - Grab the kids and head to Loco Landing Adventure Park. Experience a day of bumper boats, mini-golf and go karts. - While you’re at the beach, rent a stand-up paddleboard, kayak or if you want to see Penticton from above – try parasailing! Things are ever-changing in Penticton as the city continues to evolve and grow. We continue to see newcomers to the area, whether they are new families or retirees. The waterfront revitalization project is bringing great changes. The recently completed waterfront walkway from The Peach to the SS Sicamous is a major improvement. The wider, level walkway, upgraded lighting and benches are a great upgrade to our much-used waterfront area. Changes are happening at Skaha too, with an expanded park area and the recent opening of the Skaha Lake Fitness Park. This new outdoor gym is designed to be accessible and usable for people of all fitness levels. One thing is for sure, Penticton just keeps getting better all the time.